I don’t know about you guys, but I absolutely love the month of January. This probably comes as a surprise to those of you that know I really, really dislike winter. But I just love the feeling of a new year, a fresh start, a clean slate. It’s so energizing for me and I always get excited and hopeful thinking about the what may come in the new year. I’m not big into making resolutions, but I do really love the idea of self-improvement and creating new habits. I have so many things I want to improve and work on, but one of my primary goals this year is to get more organized. I’ve gotten better over the years, but I’m still kind of a hot mess. For example, my sock drawer looks like a bomb went off 99% of the time, which means it takes me forrrrrever to find a pair of socks. As a result of this anarchy I’m rarely ever wearing a matching pair. Sometimes I’m even wearing one long sock and one of those tiny short socks. It’s awful, I know. You’re shaking your head in disbelief right now, aren’t you? Probably questioning my life skills in general, right? I don’t blame you. But the silver lining here is that I see the problem and I want to change. It’s going to happen. This is my year! I will get more organized. I’d love to start with creating a family command center of some kind, so lately I’ve been browsing wall storage and organization. I’ve come across some really great deals, Wayfair is currently doing their year-end clearance sale, so today I wanted to share my favorite finds with you and hopefully motivate you to get organized too! All of these goodies would work really well in just about any room in your home–bathroom, mudroom, office, even your living room. The great thing about wall organization is that it’s easy. Hang it up and you’re done. No assembly, no heavy lifting, it’s just simple and efficient. 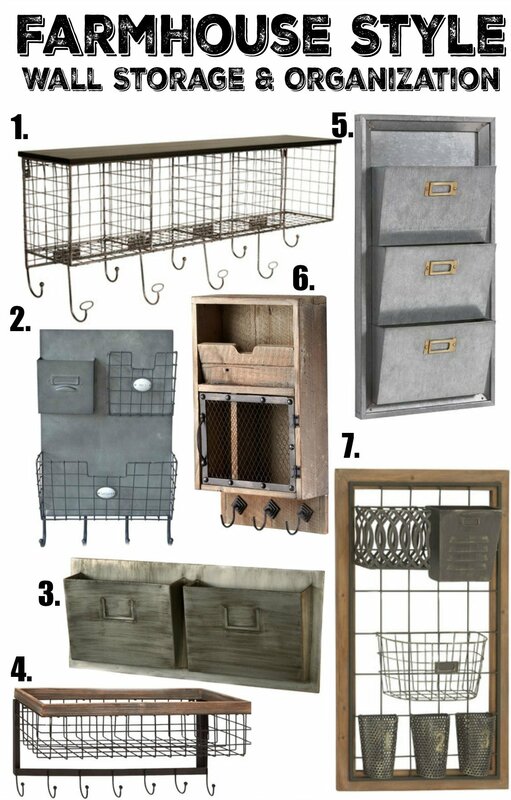 When I started my search I was really surprised to see so many industrial/farmhouse style options. Big props to Wayfair for having such an amazing selection! I hope this got you thinking about getting a little more organized in the new year. And I hope you don’t judge me too harshly about the whole sock drawer situation. I’ll work on it, I promise! You just saved me a lot of time! I want to have some kind of wall organizer right when you walk into the kitchen because right now all the mail, keys, and important school papers get thrown on the bar in the kitchen. I just ordered wall organizer #2. I can’t wait for it to come in. Now I’ve got to train the family to use it ???? Thank you!!! Oh yay! I’m so glad to hear it was helpful Lezlie! Loved all these options!!! 🙂 so cute! Wishing you and yours a blessed,healthy and happy 2017.